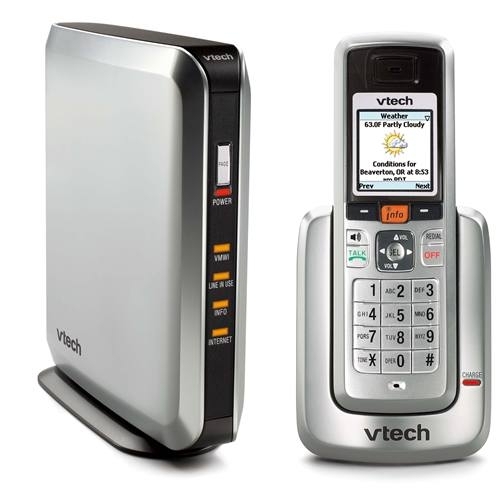 VTech’s infoPhone lets you check your email, get instant messages and read news headlines on your home landline phone handset. Spyke robot from Erector probably looks a little more exciting than he really is. A robot kit that will ship later this year, Spyke has just two motors. The arms and head only move if you adjust them by hand. It is WiFi enabled and can find its own charging station. It’s expected to retail for $269. The Emtrace Technologies WidgetStation connects to the Web via WiFi or ethernet (or USB), and displays your favorite widgets on the small screen on the right. There’s no price yet, but reps said it would be “over $100.” Look for it in the US in the first half of ’07. Sync-enabled cockpit includes steering wheel control buttons, a microphone for voice recognition in the mirror, a USB jack in the console, a small computer (not user accessible) in the dash, and the radio or LCD display. This is what the VoIP Gizmo Project looks like on the N800’s screen. Motorola CEO Ed Zander rode into his press conference on a bicycle with a built-in dynamo that can charge a mobile phone – perfect for third-world countries.